I THE PROJECT-BASED APPROACH: A NEW IDEA? II WITH TODAY'S ELECTRONIC NETWORKS, WHAT PROJECTS? Possible Activities, Operations and Outcomes using Networked Computers in the Context of a Project-based Approach. This table is illustrated by a few projects that complement the features listed. This guide is intended for teachers who have already tried the project-based collaborative approach as part of the GrassRoots program or who wish to tackle this approach with their students. More specifically, it proposes an approach whereby students use networked computers in the classroom or the computer lab for activities relating to projects for which they are responsible, with the teacher's help, and through which they can learn together and gradually develop a community of learners. The first part of this guide briefly reviews the origin and development of the project-based approach in education. The four other parts present this approach from various points of view when used with networked computers and in a collaborative context and, secondly, propose avenues, guidelines and resources which could be helpful in implementing it. These parts focus respectively on: what has been learned from recent years of experience as regards the potential of this approach and how it works; the basis of the approach; a suitable process to optimize its results; and a range of useful resources available through the Internet. In the United States, the chief pioneers of the project-based approach were John Dewey, on the experimental level, and William H. Kilpatrick, on the theoretical level. Since the first quarter of the 20th century, these two professors and researchers demonstrated the effectiveness of the project-based approach and identified its main characteristics. In Europe, the project-based approach, also referred to as education by project, has given rise to numerous experiences in several countries. The guide draws attention to the thinking and work of the Ukrainian, A. S. Makarenko, of Célestin Freinet, and of the Groupe français d'éducation nouvelle, which is still active. In the classroom, the project-based approach was used to a relatively limited extent nearly everywhere, but it never died out. It also had a significant impact on a more general educational movement, which emphasized concern for theindividuality of students and introduced into the classroom activities which promoted research, exploration, working with others and individual and group expression. With the emerging new theory of learning and with the rapid developments in telematics in the 1990s and the fast-growing World Wide Web, the project-based approach seems to have taken on new life, as demonstrated by the numerous experiments currently under way. In the projects that seem the most successful, the topics are close to students' life and interests. Initiation into the educational use of the networked computer and collaborative work is among the objectives. Some projects make this a priority objective. Under the teacher's guidance, at times very flexible and at others firmer, the starting topic or the driving question becomes a springboard for increasingly advanced learning experiences that are more and more related to the student's relationship with knowledge. The project-based approach promotes the use of multiple work methods and educational strategies. The final project outcome is consistent with the process, has a collective quality and provides persuasive proof of the depth of understanding achieved in relation to the identified learning objectives. The second sub-part of part II presents, primarily in table format, the type of activities (individual, small groups or collective) suited to the project-based approach using networked computers; the type of participants for whom this approach facilitates educational team work; the type of information and interaction among participants which it makes accessible; and the types of results than can be anticipated. The thinking of John Dewey, Charles S. Peirce and William James, and of several current authors, provides a solid foundation for the project-based approach put forward in this guide. They stress the importance of learning in cooperation with others, while retaining individual autonomy, and emphasize, among other things, the student's own participation in the act of learning; the social dimension of learning and its "negotiated" nature; the need for a process in which learning is "anchored" in the real world, "located" in the context where it took shape and targeted by the "intent" and role of guide and mediator played by the teacher. Certain experiences illustrate the results which we hope to achieve in these respects. On the operational level, the project-based collaborative approach using network computers consists in preparing, implementing and then educationally processing the activities carried out by students interacting with each other, and with various resources, especially those of the computer network to which they are connected. Each phase set out in this definition, i.e. planning a project, implementing it, and processing results, consists of two or three major activities, which in turn are logical steps in the process. The preparatory phase of the suggested approach, for instance, includes choosing a project, locating the relevant resources and organizing the cooperative work involved. The second phase consists of gradually developing a thought and documents in groups working on the project, and coordinating and blending the individual contributions within these teams, and of the teams in the class as a whole. Finally, the processing-of-the-outcomes-of-the-project phase extends from a review of the project as a whole, to follow-up activities. The final part of the guide provides electronic addresses for numerous resources accessible on the Web, indicating what each can offer for the project-based approach. These resources are divided into five categories: megasites for online resources, similar to directories of information sources; sites which support the exchange of information and ideas around the world, primarily among students; specialized Web sites designed to stimulate learners' engagement and promote cooperation among participants in joint projects; software tools for working together over the Internet; and finally, sites seeking to promote mutual support, and co-learning among teachers. We use various routes to learning. One of these routes consists in committing facts, dates, definitions and other bits of knowledge to memory. Similarly, sustained and systematic study will enable us to grasp the essentials of mathematics, history, biology or any other discipline. Ongoing conversations, personal observation of nature and society and reflection on the many experiences of daily life will also afford access to certain understandings. This guide focuses on another route for accessing knowledge, namely the project-based approach. In this case, it is through activities contributing to a collaboratively conducted "project" that those involved amass understandings, harness skills and develop attitudes that increase their overall "knowledge." Through the project exercise itself, participants may also tap their own memory banks, subject events and other phenomena to painstaking study and turn their life experiences to advantage. As well, the project-based approach described in this guide makes use of today's media and new technologies for elementary and secondary students. In the midst of these tools we find the microcomputer and its informational powers that are constantly increasing through networking with millions of other computers and plugging into a steadily growing number of reading tools for sounds and images, simulation, publishing, printing and distance transmission. A third major feature of the project-based approach stressed in this guide is that it begins with the class, and the class in its entirety, as its base of operations. The intent of the attitudes and ways of doing things suggested here is to facilitate a class's growth into a community of motivated learners combining their personal and social development with their discovery of the world. Moreover, the power of this approach to enrich and deepen communication in the classroom and lead the students to make real progress in their knowledge and the quality of their learning experience(1) is the element that provides the initial and principal argument for its use. This guide is based on questions raised and solutions proposed by teachers, researchers and others who have been closely associated with the practice of a project-based approach. The points that arise from their experiences and research have to do with, for example, the features and basis of a project-based approach; the types of projects that are desirable or, considering the technical and other limitations affecting most classrooms, possible; the ways to harmonize a rich documentary harvest by students, an appropriate choice of documents to use, genuine collaboration among students and a well-knit end product; how to elicit genuine interaction and complementarity among the students on a team and the teams in a class, as between that class and other classes or groups; the essential elements of a project that conduces to real or "authentic" learning, together with the major phases and activities to plan from a project's emergence to the follow-up it will be given after its final completion. As this guide is the first of its kind, it is necessarily experimental in nature. It is intended to help teachers who have already tested the project-based approach, particularly in the GrassRoots program, along with teachers who feel ready to tackle this approach, to proceed with greater confidence; but it is also to be hoped that their efforts will lead to the guide's improvement -- as in the case of this updated version--› and eventually to the production of other support resources and tools. Part I of this guide looks at the origins of the project-based approach along with the factors, including some recent initiatives, that have helped to redefine it and get it known. Using actual cases, Part II attempts to identify directions that emerge from projects that have already used or are now using today's technological media--essentially, the networked computer-- for educational purposes. Part III uses recent research and other experiences to highlight and illustrate the concepts and principles that can support a project-based approach as outlined in Part II, while at the same time providing a basis for broader reflection on the project-based approach as a means of consolidating real experiences. Part IV suggests a process for teachers interested in engaging their students in project-based collaborative learning. Lastly, Part V brings together suggestions for resources and strategies that are felt to be especially useful. (1) For more specifics concerning the design and features of this learning approach, see especially American Psychological Association, 1993 and SchoolNet, 1996. THE PROJECT-BASED APPROACH: A NEW IDEA? In recent years, the interest shown by so many classes in a project-based approach has often emerged in tandem with the appearance in these classes of new electronic media and specifically interactive electronic media. In both Canada and the United States, teaching organized around projects with increasingly frequent support from networked computers has become a way of motivating students, strengthening cooperation among them, renewing the pedagogy, and especially of giving more meaning to the learning experience. Is this a mere coincidence, and are the factors responsible for this situation altogether different? Or must we ascribe the emergence of this educational movement to the powers of technology? To answer this question, we have to take a quick look at the historical background. Let us see what this tells us. One fact compels recognition: the notion of organized instruction based on projects that involve contacts outside the school, manual activity and collaboration among students has formed part of the pedagogical corpus for centuries. Not until the late nineteenth century, however, did people begin to make project-based learning a core teaching element in ordinary schools and look into the conditions for its effective use. One of the very first experiments in this area took place in the laboratory school founded by the philosopher and educator John Dewey (1859-1952) and attached to the University of Chicago. Within this elementary school, the pupils were divided into teams working around specific projects. As far as possible, it was through involvement in these projects that they learned to read, write, count, pay attention to others, take on responsibilities and a number of other things. At least three of Dewey's convictions justified this approach: to learn, all pupils had to be active and produce something; all pupils had to learn how to think and -- which for Dewey amounted to more or less the same thing-- solve problems; and, finally, all pupils had to prepare themselves for life in society and thus learn to cooperate with others. The chief theorist of education based on class projects was the psychologist William H. Kilpatrick (1871-1965). The article he published in 1918 under the general title of "The Project Method" (http://scholar.lib.vt.edu/ejournals/JITE/v34n3/Knoll.html) caused a considerable stir in teacher education circles as well in the schools. Later, this Columbia University Teachers College professor and researcher greatly contributed to the spread of his "method" through his courses, lectures and a book published in 1925. For Kilpatrick, a project was a "wholehearted purposeful activity proceeding in a social environment" (1918, p. 4). His explanations pinpoint the crucial element as a "purposeful act". A number of European educators also worked on what has been called "project-based teaching." An example was the Ukrainian A.S. Makarenko (1888-1939), who was a teacher and then a principal in the regular school system but became known and inspired teachers in various countries through the principles and practices he advanced while running work communities-- generally called "colonies"-- for abandoned children and juvenile delinquents. These principles and practices included a virtually unlimited confidence in the power of education and the ability of youth to develop; the necessary awakening to social responsibility, mainly though work performed with others and for others; the assumption of the fullest possible individual and collective responsibility both in teams that each had their own characteristics and within larger structures, and the need for "prospects" and goals. In this context, the educator's role was, Makarenko argued, to open fresh vistas for the young that were steadily more demanding but never unattainable and help them focus on these vistas and ultimately reach them. The best-known European pioneer of project-based learning was Célestin Freinet (1896-1966). His influence on this as on many other components of the "new" or "modern" school was and still remains strong. In the event, it is appropriate to point out that the place he gave to the classroom use of the technological devices of his own time was remarkably similar to what this guide is suggesting be done with today's media and new technologies. Pupils in "Freinet classes" have books and other written material but they also have printing presses, record players, tape recorders and various other technological tools. Both pupils and teachers use these tools as needed and together form a steadily evolving work community. The classroom is primarily a place where everyone applies himself to some work, a place where one looks up information, exchanges opinions and discoveries, prepares a group reply to a letter from another class of pupils, prepares for investigations outside class, analyzes data and find self-expression through writings collected in a journal, oral presentations, theatricals, audiotapes, photomontages, etc. In this progressively enriched environment, team and other forms of collaboration arise naturally. The way the work is tackled also helps to create a certain community life. In short, it is Freinet's ambition to produce a human being with a head well made rather than well filled, "expert hands" and the ability to participate in constructive activities in a community "which he serves and which serves him." Among the many far-reaching changes the Groupe français d'Éducation nouvelle proposed and in many cases tried to implement for schools, project-based learning held a special place. The teacher members of this group, which is still in existence, tested the project-based approach with pupils of all ages and in most subject areas using multidisciplinary and interdisciplinary themes with widely varying resources and in the most diverse school settings. In general, the emphasis was placed on projects with links to concrete situations or problems of a social nature. The principle was laid down that all projects had to lead to changes in pupils' lives at school and out of school. In short, any school project must tend to become a life project. This teaching approach was unequivocally on the side of the supporters of pupils building their own knowledge, and contributing to the knowledge of others. As a distillation of their thinking about this both individual and social dimension of the desirable educational outcome, the French New Education Group advanced the idea ofa knowledge "auto-socio-construction" process. Entering this process, the pupil would develop a sense of research, experimentation and cooperation and improve his control over methodology, knowledge, intellectual skills and attitudes but also, at a deeper level, acquire power over his choice and use of information and accordingly over the world around him. The project-based approach is thus based on a tradition that has firm foundations and has shown results. Moreover, even though this approach has never become a regular practice in any but a limited number of classrooms, it cannot be viewed as a marginal teaching approach. Indeed, it has taken root in a lasting socio-educational movement that has been proposing major changes in classroom teaching since the very dawn of the twentieth century in both North America and Europe. Depending on times and places, this movement has been associated to the "new" or "modern," "active" or "alternative" school, the school "without walls", "open school", the "activity movement" or "progressive education." The cornerstone of this movement is the attention paid to each pupil: his home environment, existing knowledge, motivation, foci of attention, work methods - in short, his individuality. Many experiments have proven that this basic approach brings with it a number of consequences. One of these is that the classroom has to provide numerous activities in which the pupils take part. And these activities have to give the pupils a chance to adopt a searching and exploring mentality, interact, work with their hands, do things together and express themselves in various ways. Another consequence of this pupil-centred teaching approach is the need for very frequent review of proposed content, which has to be meaningful in relation to personal concerns or natural or social realities which the pupil himself is able to observe or grasp in some other way. The result of all this is that the teacher must convey less information directly, issue fewer directives and instead be a guide in both senses of that word, namely someone who knows and points to avenues leading to the desired learning outcome and someone who is able to help another to overcome his initial stumbling and hesitation or lack of self-confidence and in a way act as the "companion" of his personal development. Whereas initially, as previously mentioned, this general movement placed the emphasis on the pupil's personal characteristics and his more conscious and active role in his own learning experience, the emphasis nowadays is placed on the conditions for a truly assimilated learning experience and the strategies needed to bring this about, as well as the pupil's participation in developing an evolving body of knowledge. It appears that during the last century the project-based approach gradually absorbed a good number of proposals concerning classroom activity from the "active" school movement. It has thus become one of the main concrete ways in which that movement is expressing itself in the 1990s. The project-based approach is therefore not a new idea, but as it has become established in the past few years it does have new content. Moreover, the development of telematics (the meeting ground of telecommunications and informatics) expanded its potential to the point where many see it as endowed with a semblance of novelty. Today, the Web is amplifying this process. North America is the scene of increasingly numerous experiments that have begun to open up this potential. The SchoolNet Grassroots program has now supported over 15 000 of them, most of which have shown what can be accomplished with very modest means. Other programs exist, some of which have attracted special attention. This is the case, for example, with the CoVis project (Learning Through Collaborative Visualization) (http://www.covis.nwu.edu) that has been a forerunner in online collaboration among students. Another example is "MOST" (Missouri Supporting Teachers) (http://www.coe.missouri.edu/~most/), a project that promotes student immersion in real scientific communities and thus enables them to learn the rudiments of the scientific culture, including the use of tools the researchers use themselves (see Laffey et al., 1998, p. 79). Certain articles and books on the list of major documents used for this study contain details about these and other experiments (see, for example, Brown, 1997, Dede, 1998, Pea, 1993 and Riel and Harasim, 1994). As well, Part II and Part V (Resources) point to a number of sources where one can find information on the principles, orientations, teaching strategies, outcomes and other aspects of numerous actual projects. Part II that follows is based on what is known about these projects and seems to be common to a high percentage of them, at least as regards their intentions, in order to briefly highlight what it is today that makes up a project-based approach using a networked computer in the classroom or the computer lab. In this sense, it completes the picture given in this initial part. At the same time, however, it is also a way for teachers to familiarize themselves with a thoroughly contemporary project-based approach. Some of the electronic networks cited in the title of this section serve only a limited number of users for specific purposes and are called "intranets." Others are open to everyone in a given area wanting to tie in, as is the case with the Internet, have ramifications worldwide. The information disseminated by these networks may come directly from people making contact-- here we are referring to "E-mail" and, in the same vein, online dialogue through electronic discussion forums, videoconferencing and other modes of interpersonal communication-or has previously been loaded on a Web site or some information bank. These computers, more and more equipped with printers, scanners, videocassette players and CD-ROM readers and other so-called peripherals, make it possible to access information in various forms (written, graphic, audio, video, multimedia, etc.). the types of outcomes anticipated on completion of these projects. In a second subpart, three tables with brief comments highlight what emerges from these observations concerning the nature and general operation of an educational approach in which students work together supported by networked computers to carry out projects that have meaning for them and bring them to substantial and well-assimilated learning experiences. 1.1 In the projects that seem the most successful, the topics are close to students' lives and interests. The topics classrooms choose as their basis for developing projects are usually drawn from the following three sources: a component or specific aspect of the natural or animal world; social realities of concern to the communities the students in these classes come from; and phenomena or events, real or imagined, from the present or the past, that stimulate these students' imaginations. The forest and the polar bear are examples of the first source of inspiration, injustice and leisure occupations may stand for the second, and the third may be represented by dinosaurs and the Gallic wars. At the moment they begin studying a topic, most pupils will already -- through personal observation, experience or imagination -- have some "knowledge," however scanty this may be. TABLE 1 below lists a few examples of topics from the SchoolNet GrassRoots program. We note that topics 1, 4, 5, 9 and 10 (described in section 1.2) and subtopic 11.1 have to do with the natural or animal world, while topics 3 (described below), 6, 7 and 8 relate to social realities and topic 2 along with subtopic 11.2 relate to phenomena or events that are out of the ordinary. The documentation we looked at contains many other examples. In a case featuring the natural environment and animals, one classroom was concerned by the water quality in a nearby lake or river while another was focusing on a planet, plant or insect. Relative to the social environment, classes are wondering about the appropriateness of building a new bridge in a town or protecting an old structure from being demolished. Lastly, students of all ages will readily find topics that interest them in the long list of the phenomena that have marked changes in the natural world from the Big Bang to El NiÒo by way of the emergence of life or the evolution of animal life (climate changes, disasters, human intervention, etc.) and the events that have shifted the course of history (inventions, wars, the actions of great personalities, etc.). The box entitled, "An International Investigation into Television Habits" summarizes a project that focuses on a social phenomenon that is both ubiquitous and familiar to the young. Because of the messages it sends, television also opens the way to many other topics. On the initiative of an Ottawa classroom, pupils aged 10 to 12 in classes across a dozen countries have combined forces to conduct an investigation into the television viewing habits of about 4,000 children of their own age. At the first stage, the pupils of each class kept track of the time they spent watching television and the programs they watched for one week, then compiled and analyzed the results for girls, boys and all their classmates put together. Secondly, they highlighted the differences between girls and boys with respect to their most-watched programming. Lastly, everyone answered a questionnaire on the violence, role models and advertising shown on the small screen. Operations were coordinated by E-mail, and this was how each class's results were forwarded to the Ottawa group that had launched the project. This class then compiled and analyzed all the results and sent the overall picture that emerged to each of the participating classes. This observation fits in with the viewpoint of the researchers who see project-based learning as "a form of contextual instruction that places great emphasis on student problem-finding and framing, and which is often carried out over extended periods of time" (Laffey et al., 1998, p. 74) or who hold that, with this approach, "students pursue solutions to authentic problems by asking and refining questions, debating ideas, making predictions, designing plans and/or experiments, gathering information, collecting and analyzing data, drawing conclusions, and communicating their ideas and findings to others" (Krajcik, Blumenfeld, Marx and Soloway, 1994, p.483, in ibid. our italics). 1.2 Initiation into the educational use of the networked computer and collaborative work is among the objectives. Some projects make this a priority objective. It is important not to confuse skill in handling a computer or piece of software with the use of this skill for seeking, sorting and classifying relevant data. The fact that large numbers of today's students are comfortable with electronic media does not automatically mean that they are able to use computers methodically and effectively for more and more demanding learning experiences --the ones called for by schools being an example. Many teachers trying a project-based approach using the technology described above have found that the situation required initiating the students, and themselves as well, into an educational use of this technology and collaborative work and that the time and energy needed could become substantial. This initiation involves, for example, an ability to carve up a project, employ computers for exploration, deep understanding, and communication purposes, comparing data from different sources and learning from one another. Awareness of this situation has prompted educators to plan projects with an initial phase during which the learning objectives in a given subject area or topic --language, biology or the great rivers of North America-- will only partly depend on the use of a computer. In these cases the priority objective, though usually not the exclusive one, is the operation of the networked computer and software, or learnware, as learning tools. In the project briefly outlined below ("A Trip to the Mountains and on the Internet") the emphasis is placed, not on studying the Rocky Mountains, though there is an attempt to get to know them better, but on using E-mail and the Internet to produce an online journal. In this way, students acquire the resources to share knowledge with others more effectively during another phase of the same project or when conducting another project. About forty students from Grade 9 through 12 from five Francophone Manitoba schools maintained contact with their classmates and a number of other people during an eight-day skiing trip to the Rocky Mountains. Every day, thanks to E-mail, they sent a team of students and teachers in Manitoba articles detailing their activities and discoveries. Within hours, these articles were published in a Web site accessible to everyone who had the address. They could also add their comments and questions. This project has shown the students the advantages of E-mail and the Internet and familiarized them with their use. It has also enabled them to learn about history, geography, writing and the requirements of teamwork. 1.3 Under the teacher's guidance, at times very flexible and at others firmer, the starting topic, or the driving question, becomes a springboard for increasingly advanced learning experiences that engage the student more and more deeply in a relationship with knowledge. The class's initial interest in a topic or a question is essential but perceived in successful educational experiments as only a first step. Under the teacher's direction, the classroom will dissect and discuss the topic's major components and expand them or, depending on the case, limit its application and define its range. By degrees, the topic becomes a project and their spontaneous interest becomes commitment to a research process. There have been numerous experiments to tell us that, if the project developed possesses a certain breadth, the student will learn to place the questions he asks in a truer perspective and find that in order to answer them he must himself become capable of observing, describing, naming, comparing, classifying, synthesizing, assessing and carrying out various other intellectual operations. As he takes on new challenges from project to project, he will also discover that the skills required to address an inquiry question are more and more complex. In this process and by degrees, he is initiated into the requirements of the scientific method, logical reasoning and collaboration with other students. Topics that offer good potential for educational use will influence the student's intellectual development and attitudes to learning, but also the concept he forms of knowledge itself. In a class where project-based learning is practised with the networked computer, each topic takes on meaning in relation to other topics. Knowledge is perceived as a dynamic reality. As a result, multidisciplinarity and interdisciplinarity are axiomatic: the very process of researching a social phenomenon like television requires learning a certain vocabulary, mathematical formulas and geographical concepts (see above, in 1.1, "An International Investigation into Television Habits"). Similarly, we need historical knowledge in order to fully grasp the importance of the discovery of microbes, the atom, the laws of thermodynamics and a large number of other scientific discoveries. Because it provides access to current data on very specific problems as well as for theoretical research and on today's events as well as our centuries-old heritage, the use of the latest technologies helps to make the living and endlessly changing nature of knowledge even more obvious to the student. 1.4 The project-based approach promotes the use of multiple work methods and educational strategies. The notion of a project-based approach in the classroom in itself suggests collaboration by a number of people. This is even more clearly the case with a project-based approach which, as in this guide, attempts to make the best use of a number of interconnected computers. The projects chosen in these circumstances will necessarily involve at some point, while the topics or questions of these projects are being explored or the results are being processed, task sharing by students and their contacting other people and various organizations and coordinating multitudinous operations and on many occasions pooling partial results. Even if a student team (which may be a classroom) assumes responsibility for a project and the most visible outcomes are expected at that level, the individual work of each team member will still be vital. Indeed, each of them will be called on to locate information, weigh its value and organize it, write and calculate, make plans, conduct experiments, present and discuss results, create visual montages and carry out a host of other activities. Some projects are also broad-based enough for students or a team of students to tack on specific learning objectives or even a more specific project of some kind (see Desbiens, 1998). The North American Schools for Thought project is being backed by three teams that pooled their efforts to bring it into being the results of their research and experiments in schools (see, e.g., Williams et al., 1998). One of these teams, which is from Ontario, is behind an approach to using networked computers known as the Computer Supported Intentional Learning Environments (CSILE). In this program, students are placed in research and collaboration situations and, in various ways, including continuous dialogue among them assisted by notes, deep understanding of a shared object while at the same time actively participating in developing new knowledge. A second team, the Cognition and Technology Group, is attached to Vanderbilt University in Tennessee. In a number of projects, its members place the emphasis on team solving of real or potential problems. More specifically, they are trying to promote "authentic" or "anchored instruction." Lastly, a third team whose principals were psychologists Ann Brown and Joseph Campione focused its efforts particularly on "fostering communities of learners." The project-based approach with networked computers creates a setting that fosters, simultaneously and in a complementary way, teamwork and individual work, but also the use in both cases of multiple work methods and learning strategies. Quite naturally -- which does not mean automatically --, students are invited to raise questions, but also to find answers; to express themselves in writing, but also orally and visually; to do analytic as well as synthesis work; to develop intellectual skills, but social skills as well and, to take one more example, employ cognitive strategies, but also metacognitive ones. In recent years, a number of projects somewhat related in their approach to the one used by this guide (see, e.g., the box story above entitled "Schools for Thought") have demonstrated great ability to integrate highly diverse methodological and educational concerns and, as a result, take into consideration students' ages, motivations and the other major characteristics that weigh on their learning process. In this common undertaking, the latest technological resources are used to stimulate, through a variety of projects, the creation of communities of learners that draw on the best sources to find answers to questions that have meaning for students. However, more traditional tools like pencils, exercise books and other books are still always used. While maintaining certain elements of the traditional school, we attempt to add other elements that expand and refurbish the range of methods and strategies available to teachers. 1.5 The final project outcome is consistent with the process, has a collective quality and provides persuasive proof of the depth of understanding achieved in relation to the identified learning objectives. In a project-based approach, the processes of "doing" things and "learning" things are inextricably bound together (see Blumenfeld et al., 1991, p. 372). It is by seeking the answer to a question or problem of some importance that students discover laws, dates and a thousand other data, make connections among them and learn to make other uses of their brains and hands. It is therefore logical that it should be what has been "done," in other words the resultant "product," which is used to evaluate what has been learned. In concrete terms, this product is a piece of writing, an object, audiotape, behaviour in a given situation, presentation in front of the class or another group or any other "piece of work" that evidences a collaborative learning process. As for the criteria for assessing the extent, depth or any other quality of the depth of understanding achieved, they are the learning objectives prescribed in the curriculum of the school or schools. In a project-based approach with networked computers, however, these learnings have usually been reconfigured in more interdisciplinary or even transdisciplinary terms, for example around major concepts, topics or questions that require research and reflection. If the product has a collective feel to it, this is primarily because the underlying question required collaboration or at least could be more satisfactorily answered via a collaborative process. The product is therefore not just an assembly of individual labours: while integrating the contribution of each and every student, it also goes beyond these to build a synthesis that is discussed and validated in its own right. The project topics, the initiation into the educational use of networked computers and collaborative work, the probing into the topic or the question by each student under the teacher's flexible yet firm direction, the use of multiple work methods and learning strategies and the qualities of the end result are so many factors to be weighed very carefully when developing and conducting learning projects. It may be appropriate, by way of conclusion, to come back more particularly to the attention to be given the students. From this standpoint, a good project has to have a motivating effect on them and conduce to meaningful learning experiences. In a substantial article on the interactions between motivation and learning in a project-based approach, a team of University of Michigan researchers used these words, based on T.W. Malone and M.R. Lepper (1987), to describe what can motivate students: "Student interest and perceived value are enhanced when (a) tasks are varied and include novel elements; (b) the problem is authentic and has value; (c) the problem is challenging; (d) there is closure, so that an artifact is created; (e) there is choice about what and/or how work is done; and (f) there are opportunities to work with others" (Blumenfeld et al, 1991, p. 375). As already indicated, the project-based approach implies that the planned educational activity becomes the responsibility of a team or group. This group may include only a few students but it can also encompass a larger number, for example all the students in a class. This group work does not supplant all individual work: on the contrary, it requires such work. However, unlike what usually goes on in a regular class, the context and objective of this individual work is a collective product or "piece of work." In the project-based approach described in this guide, the three main agents - the student, project team and class (including the teacher or teachers in charge) - can use the networked computer to develop multiple collaborative relationships among themselves but also with any other individual, team, class, group or organization hooked up to the network. The major operations to which a school link-up opens the way have to do with information and interpersonal interaction. The information accessed by students and transmitted by them to others can be connected with any subject taught in the classroom and be available in various forms (text, graphics, animation, etc.). Moreover, through the interactions they develop with others, students will learn to exchange points of view, engage in discussion, clarify their thinking and thus assimilate new understandings, hone their skills (intellectual, social, etc.) and consolidate their identities. The result of this dual process is a learning experience that takes concrete form in a text, database, service to a group of people, activity in a business, commented presentation or any other communicable "product." Whether the activities conducted in the course of a learning project supported by networked computers are carried out by an individual (student or educator), small group or a larger collectivity, one of its major characteristics is being relational. These relations, electronic in this case, can in every circumstance be established with another person, small group, class or any Web site on the planet. This is brought out in TABLE 3. Finally, TABLE 4 is intended to lend specificity to the contents of Tables 2 and 3. For each operational category (information and interpersonal interaction) and each activity type (individual, small group or collective, with each of these able to have as agents individuals, small groups, classes and various other players linked up to the same network), the table provides illustrations of specific activities and possible outcomes. This exercise, which every reader is invited to undergo, demonstrates that these possibilities are particularly abundant if we call on every working tool available (software for word processing, publishing, research, calculus, planning, E-mail, electronic forums, etc.) and every access route to relevant content (databases, historic, scientific or other sites, ongoing work in other classes, online dialogues, experts, etc.). It should be noted that every illustration in this table is independent of every other. However, the table may very well be used as a grid for establishing links between specific activities and between these activities and their expected results. We saw it in Part I: the project-based approach is at least a century-old notion. Since the turn of the nineteenth century it has evolved in various directions and borrowed various forms at different times and in different cultural contexts. For the past dozen or so years it has been undergoing a major reassessment. The main factors in this reassessment have been evolving considerations about the learning process and, closely linked to this line of thought, the availability of online resources and the networked computer in particular. The sections of this chapter draw on these two leavens of change: we begin by focusing attention on some sources of conceptual support and their implications and move on to look at some experiments carried out in the wake of this support using networked computers. Since this century began, Dewey's pragmatic thinking and prolific writing, instigated by Charles S. Peirce and William James, has been providing a basis for the pragmatic view (http://deming.eng.clemson.edu/pub/den/deming_as_prag.htm) holding that everyone, young or adult, learns by observing the consequences of his acts or through his relations, or "transactions," with his environment. However, given students' lack of autonomy, the scarcity of available classroom resources and the limited training required until recently for successful entry into the working world and society generally, the attempts to carry these concepts into effect in the education system have resulted in situations that were both hard to maintain and felt to be too demanding. Now, with the information and communication technologies (ICTs), a project-based approach becomes more possible. And what this approach has to offer also becomes more socially relevant, even necessary. Indeed, current developments in our political, economic, cultural and other areas, their global interrelationships and the emergence of a knowledge society are so many phenomena that call for a population that is not only more educated, more intellectually independent and more capable of creativeness, but also, in social life generally as well as the working world, better prepared to function in collaboration with others. Among the complementary paths that education must henceforth take are, according to the International Commission on Education for the Twenty-first Century created by UNESCO, "the gradual discovery of others" on one level and, on a second level, "the experience of shared purposes throughout life" (1996, p. 92). During the decades when the working world's main need was an obedient labour force that was ready for individual exertion, the behaviourism of Edward L. Thorndike and the followers of this theory called up a response in the educational community to this social need. Today, the educational approach advocated by Dewey is the one gaining in relevance --"Learning is thinking," John Abbott (1998) reminded several hundred school administrators meeting in Quebec City specifically to discuss the integration of the new technologies with education. Consequently, the project-based approach of which he was one of the chief pioneers is viewed as an option that is likely to enable a greater number of students to develop their potential and assume their proper roles (as citizens, workers, family members, learners, etc.) in our evolving society. This considerable increase in requirements draws our attention to the importance of motivation to learn. Today, there are many studies to show that placing students in the position of discovering the world and sharing the results of their explorations, investigations or problem solving, as the project-based approach would have them do, represents one of the best ways of arousing and sustaining this motivation. The outcomes of their empirical explorations also provide students with matter for reflection. Through this reflection, their own discoveries and, gradually, the world itself acquire meaning. As a well-known educational maxim has it, we learn by doing. The networked computer provides the teacher with a multi-faceted resource for encouraging students to experiment and see the results of their activities for themselves. Paradoxically, the resources employed to get students to move from a listening situation to one in which they are active participants in discovering reality (research on the Web, simulations, the use of collaborative software, etc.) often emanate from the so-called "virtual" world. Researchers in the cognitive sciences (Lave, 1988; Brown, Collins and Duguid, 1989) convincingly demonstrated that the act of learning is also the interpretation of an experience, language or phenomenon grasped in context. After this, the cognitive sciences, with their four decades of association with computers, were brought to provide more and more powerful support to the approaches that link experience with learning and afford students a more active classroom role by offering them learning situations that require cognitive and metacognitive involvement along with collaborative work. Indeed, as Ward and Tiessen state, collaboratively conducted project-based learning is "an instructional approach that attempts to engage students in the intentional pursuit of their own learning goals and in social interactions aimed toward the development of understanding" (1997b, p. 299). So that the project-based collaborative approach can foster the assimilation of complex learning processes, the use of the following ideas and principles in connection with one or another of the basic components of any educational situation is suggested. The interactions that occur in educational situations enable students to be at the centre of ongoing learning activities and, for example, open and close "conversations" related to learning objectives known in advance (see Scardamalia and Bereiter, 1989, on the notion of "intentional learning"). The interpretative abilities students have individually and collectively acquired are highlighted by Jerome Bruner, who, following Jean Piaget, places emphasis on this learner characteristic. Ideas and concepts that refer back to social and cultural representations a student can recognize are more readily accessible to him. In other words, "the act of understanding is no longer a process of coming to know the entities and attributes that exist in the world, but one of successfully negotiating the meaning of these objects with others" (Hewitt and Scardamalia, 1998, p. 77). The student's interest in learning is observed in context where choices are provided. Participation in decision making is known to heighten student engagement and to add value to the learning task (Krapp, Hidi and Renninger, 1992). When a learning project evolves around a real-world problem, the student is even more motivated by the collective interest for solving the problem than by the problem itself (Hickey, 1997). The student is called on to play various roles in the classroom, all of them connected with learning objectives. It is desirable that the roles he plays should encourage his increasingly central participation in the learning process (see Lave and Wenger, 1991 and Brown, Collins and Duguid, 1989). In a learning project, the student will take part in the management process for the whole project and not just a part of it. As a rule, the teacher will present the material to be learned through a series of tasks and activities. In a project-based approach, each student and the class as a whole must make the learning objectives their own; learning here is seen as a conscious process that is desired and driven by "intention" (see Bereiter and Scardamalia, 1989). Moreover, according to researchers Resnick (1987) and Brown, Collins and Duguid (1989), learning activities that draw on real-life situations have more interest for students than the ones used in most classrooms. With the teacher's help, students face real problems. The teacher will structure his or her intervention by planning activities which, while attuned to student abilities, present increasing levels of difficulty. Student interactions with a given content have to include time for exploration, but also for negotiations based on how they see this content and for concordance on the degree of agreement they share and the action that logically ensues. The objective is to achieve a meaningful or "anchored" learning experience (see Bransford, 1990; Bransford, Brown and Cocking, 2000). More complex material can be studied from multiple standpoints, alternately falling back and moving forward. The teacher's responsibility is central. The mere fact that, for example, the student has easy access to the information on the Web will not automatically lead to the understanding deemed necessary. Teacher mediation is crucial here. For about twenty years, cognitive sciences researchers, drawing on the work of the Russian psychologist Lev S. Vygotsky from the 1920s and early 1930s, have demonstrated its importance. Networked computers provide direct access to information and potential for interaction outside the classroom, but the responsibility for student learning falls nonetheless, first and foremost, to the teacher. The teacher's role is that of guide in a community of learners; in particular, the teacher facilitates student activities through careful scaffolding (see Brown and Campione, 1994 and 1996, and Cognition and Technology Group at Vanderbilt, 1994). In a community of learners, students assume complementary social roles and learn, for example, to control their own performance or behaviour by controlling others'. The teacher's expected mediation is, in Vygotsky's view, double-edged: cognitive and metacognitive. Through mediation based on metacognition, the teacher brings the student to gradually take over his learning process (to plan, direct, control, check and assess it). As the student becomes more adept, the teacher will offload responsibilities (see also Feuerstein and Rand, 1974). When it comes to cognitive mediation, the emphasis is placed on the assimilation of knowledge that is both "declarative" (of facts, data, in short what is) and "procedural" (how to do this or that in order to achieve a given purpose): the first type of knowledge has to be tied to the second type if we want real development of students' reasoning skills and an ability to apply ideas learned with flexibility (see also Davydov, 1993, tr. Kerr, 1995). It is not so much by listening to their teacher talk about the methods of scientific analysis, here considered as cognitive mediation tools, as by using these methods themselves that students will learn to master them and make them their own (see Karpov and Haywood, 1998). Next-generation tools such as Knowledge Forum assist the teacher in (a) scaffolding student learning activity, and (b) keeping trace of student online dialogues and knowledge-building processes (see Part V). The approach brought forward for consideration here is "situated" learning (see Lave, 1988 and 1991). According to this approach, based on Vygotsky's theories, the acquisition of new understandings cannot be separated from the context in which it occurs. Since most people think that the student's mental representations are internal (see Anderson, Reder and Simon, 1996) and knowledge exists in the individual mind ("container model"), the suggestion that cognition is the result of the meeting of people, objects and situations (Hewitt and Scardamalia, 1998, pp. 78 and 80) comes as something of a surprise. The researchers who see learning as situated offer the following justification: understandings, occurring in real contexts, exist through the way in which class members (pupils and teachers) communicate among themselves, discuss their interpretations and organize their processes and behaviours as well as through the permitted strategies and the other tools and resources used in the class. Having been shaped in a given context, the outlines of a learning project can be expanded through the use of the networked computer that is plugged into the local and world communities. The project-based approach creates a physical and social context based on which the student will create his representations of concepts, ideas and principles. Hence the importance of providing the student with a learning context and giving him problems to solve that are as real and authentic as possible, while taking his previous knowledge into account. However, enriching the learning context with computers calls for constant vigilance on the part of the teacher with regard to the people and other resources that can be accessed through electronic networks. "Good teachers filter what enters the classroom to provide fundamental, concrete experiences that children can respond to, make sense of, and use to gain an understanding of the progressively more complex things and subjects to come" (Pepi and Scheurman, 1996, p. 234). These writers base their warning on the following comments by Dewey: "The first office of the social organ we call a school is to provide a simplified environment " (1966, p. 20). And here, far from relying on "frontal" teaching where the emphasis has been and remains on acquiring knowledge in a listening mode, this great thinker promoted, as we saw in Part I, learning by doing. This section offers some succinct examples of the way the learning process is tackled by a project-based approach using networked computers and software that fosters cooperation among students. Where available, the results are summarized as well. This project started in 1986 and is based on science teaching in the early high-school years and more specifically on Newton's theories. In this project, "the class becomes a research community and students propose and test out competing theories with the aid of computer models. They compare findings and discuss which models and theories offer the most powerful explanations. It has had a sizable impact not only on students' learning of physics principles but also of inquiry in general" (Reported by Perkins and Grotzer, 1997, p. 1129; see also White and Frederiksen, 1995). Various projects in the late 1980s used networked computer-assisted communication to enhance learning through direct action in the area of environmental responsibility; the means used were the exchange of real data among classes, collaborative efforts by classes and university teams to resolve certain problems and wider dissemination of results. In an Australian water quality project, a school revealed the presence of a hazardous substance and this information was provided to the local authorities, who took action (see Robottom and Hart, 1990). Some 16 schools took part in the Rouge River Project (see Wals, Monroe and Stapp, 1990), which inspired the Canadian Grand Watershed Project (see McMahen and Dawson, 1995). Waugh and Levin (1988) reviewed various projects in which students approached issues the way researchers do. Their own project, called Noon Observation, which reached students around the world, involved measuring the Earth's circumference based on the measurement of shadows at midday solar time in different locations on a specific day (see McMahel and Dawson, 1995). When a project is based on the solution of real problems, "students acquire and apply concepts and principles in their investigations, they formulate plans, track progress, evaluate solutions, and produce artifacts(2) related to the problem", report Krajcik, Blumenfeld, Marx and Soloway (1994, pp. 483-484). These cognitive science researchers are working with teachers in the State of Michigan to implement the project-based approach in science secondary classes. "Orchestration among the features, assert the same authors, results in classrooms where students are afforded opportunities to construct knowledge actively and to think critically and are motivated to take responsibility for their learning" (Ibid., p. 486). In the neighboring State of Illinois, Louis M. Gomez and his research team have been testing an electronic progress portfolio. The purpose of this tool is to facilitate thoughtful exploration activities by high-school students. One group of students conducted research on the planet Pluto's orbit around the sun by using this portfolio to describe their work in progress and enter and organize the data they gathered. To present their results, the students used software like Hyper Studio and Claris Home Page (see Loh et al., 1997, pp. 174-175). The students also used the progress portfolio to go back over their activity (see id., p. 176). The researchers conclude by emphasizing that this tool has encouraged students to do thought-out research while further applying in concrete ways certain methodological aspects of their exploration programs. e) The 22 French schools participating in the "L'eau" project on water (http://www.ac-toulouse.fr/piquecos/pages/eau.html) combined to produce a CD-ROM that was chosen in 1997 by France's national education ministry for a European educational multimedia competition. A second project of the same type is on the way and will focus on eco-citizenship. In 1995, this network encompassed about 1,000 schools with representation on every continent (see Copen, 1995). Its aim is to promote a better understanding of other cultures and world problems among students from kindergarten to senior high school and thus prepare them for the challenges they will have to face as adults. It works through projects students build with their teachers. In fact, the students are active participants in all project phases, with the teachers seen more as "facilitators." Most of the projects focus on actual social or environmental problems, but some tackle other topics. Information and dialogue by E-mail are important elements, but projects usually seem to have very specific end goals (an international paper, comparison of data on a scientific phenomenon, an exchange of artwork, or even financial assistance for building water pumps in Nicaraguan villages). These projects form part of regular class activities. Various reports indicate that they enrich course content and have a positive effect on student motivation. One might add that they provide settings that greatly encourage awareness of foreign languages. Such projects show that networked computers enable classes to engage in learning projects in which students are active and, in the best cases, participate in knowledge building activities, make connections between course content and actual situations and have access to varied and up-to-date documentation: the teachers act as guides or companions. Without networked computers, a number of these projects would be inconceivable. Theses projects are numerous in Anglophone than in Francophone communities and are more often based on languages and mathematics than other scholl subjects. However, new projects appear as school and classrooms hook up to networks. Teachers wishing to develop projects with their students will find a suggested process and list of resources in the next two parts of this guide (IV and V). (2) The term "artifact," often used these days in the North American project-based learning stream, refers to any expression of a cognitive learning process by students that takes tangible form and is likely to arouse varied opinions. It is close in meaning to the term "product," or "production" (see, for example, Blumenfeld et al., 1991, p. 370, n. 1). Drawing on experiments carried out thus far, this part offers the broad outlines and major elements of a general project-based approach using networked computers. From the teacher's standpoint, this process is a special class management method, in the circumstances a method that displays a number of affinities with "facilitation", "pedagogical supervision" and "participatory class management." In essence, it relies largely on activities involving all class members to encourage their curiosity and perseverance and create interactions and windows of collaboration for them that are directed towards specific learning objectives. Moving from the psychosocial to the cognitive angle and still from the teacher's standpoint, we can offer this definition of a networked computer-assisted project-based approach: the involvement of each and every student in activities that aimed at individual, team and class learning objectives, beginning with their prior knowledge and scaffolding their processes of exploration, comprehension, problem solving and the production of tangible collective results. The class management approach suggested in the following pages is based on this definition and the one in the first paragraph above. Our suggested process occurs in three phases: project planning, project implementation and results processing. Operationally, then, we can state that the project-based approach with networked computers consists in preparing, implementing and then processing the results, including activities carried out by students interacting with one another and with various resources, especially the ones on the computer network they are hooked up to. By its very nature, a project is a time-limited activity resulting in an original creation or specific service (inspired by PMI Standards Committee, 1996, p. 4). Each of its phases leads to a well-defined outcome: the result of the first phase is a plan; of the second, one or more "products," and the third phase results in evidence of collective understanding by the class. The process involving one or possibly more than one project at a time may, depending on the case, occupy a more or less conspicuous place in the school timetable. Teachers may also use a project-based approach on a regular basis or only from time to time. Again, two or more teachers covering the same subject or different subjects can choose among a variety of agreements to join in conducting a project or series of projects. Another issue that is sometimes hard to resolve is what links to establish between project objectives and the objectives of a part of the curriculum. What can be done in this area may vary considerably from school to school, depending on school policies but also on teachers' professional judgment. Figure 1 below shows the three phases cited above in their continuity along with some of the major activities associated with them. Especially for the activities, the terms used are merely indicative. The same applies to their sequence: though these activities have a logical sequence, they will almost always tie in with the actual flow of a project, and to maintain consistency it is often necessary to go back over an earlier stage for fresh clarifications or to make some adjustment. A learning project is not built like a bridge. Figure 1 may be perceived in two or three dimensions. Imagine, for example, your classroom on a school bus that leaves the highway temporarily to take a pleasanter road with better scenery that is very probably a little longer. Secondly, imagine that your class is still on a school bus but the bus changes temporarily into an airplane that takes off for a flight and then lands and continues its journey on the ground. In both cases, linearity, the routine of the route, will have been broken since, at a given point, the class took another road or took flight while still sticking to the same direction. Considering the usual practices in education, the process pictured below is likely to strike some as a series of activities which rarely take place only in the classroom. As we shall see in Part V, the networked computer offers increasing avenues for collaboration among various partners in order to conduct collaborative projects, and there is every reason to believe that this pattern will continue. Above anything else, it is important that every project clearly support the achievement of locally identified learning objectives for teachers as well as for students. Contrary to what happens on a real trip, where the discoveries we make repay the trouble ("That detour was worth it," people will say), the mere fact that the people on the bus or plane described above take a route where they seem to learn more and better is not usually enough. Third parties who are more or less numerous and in more or less powerful positions, depending on the project in question, will also have something to say before a project is recognized as a success beyond the classroom. Some of these third parties are school principals, parents, school councils, educational authorities and the Ministry of Education. The more likely a project is to attract attention or require resources, the more necessary it will be to keep the relevant authorities informed and be sensitive to their expectations. As engrossing as a project may be, it will be seen as "an unnecessary detour" or even "a waste of time" if the higher-ups have not grasped its interest and significance. It is up to the teachers to decide whether it will be appropriate to get involved with their classes in projects and the types of projects they will be (short or long, around concepts or topics, limited to one subject area or combining various disciplines, etc.). Using their professional judgment, teachers will also anticipate, for example, what links will be set up with what teaching subject(s) and the official curricula, what tasks will be carried out individually or by students in small groups and whether the project will bring classes into contact with other classes, experts or the local communities. A project's feasibility and educational relevance are two of the criteria that will help to light the way for the teacher's decision. The latter brings a reminder that class time is valuable, terminal objectives have to be met, locally approved curriculum orientations have to be respected and that considering the time available, objectives defined and directions decided on, all the students will have to be able to engage in a relevant learning process. As for the feasibility criterion, it comes more as an incentive to weigh the estimated time a project will need, available resources (equipment, software, various documents, etc. ), foreseeable sources of support and student capabilities. It may appropriately be recalled that this last factor should be seen as dynamic and not static: in a project designed for learning, it is axiomatic that student capabilities will increase as things go along. The idea for a project, or a project with a particular theme, may come from a number of sources and arise in widely varying contexts. Before making any commitment, the class will have to answer at least these two questions: What exactly is involved? What do we as a class want to do? Whether the initiative is taken by the teacher or a student or a group of students, project-based learning together means that the whole class will very soon see an occasion to discuss it. A project idea may also come up in a regular class discussion - when, for example, the students show special interest in an issue or problem. Whatever the hypothesis, student appropriation of the project is a necessary condition for its success. Agreement on a written plan will be the tangible sign of this appropriation. In addition to a description of the chosen topic, the plan will contain learning objectives and assessment criteria. (3) The objectives will focus on the concepts, ideas and other essential components encompassed by the topic or question, on the skills and possibly the attitudes it will more specifically seek to develop and, ultimately, on the outcomes or "products" through which the students will express what they have learned. The criteria will make it possible to assess the outcomes and compare them with the proficiency considered appropriate in the circumstances. For students, the chance to imagine the collective achievement ahead is going to stimulate their metacognitive skills - they will spontaneously begin making plans, offering suggestions about the way to proceed, etc. Given that the computer on a network for learning purposes in a school setting is a new tool, the plan will also in many cases leave room for acquiring the needed skills for using the available equipment and software effectively in learning. The GrassRoots program, like other experiments, has shown that student shortcomings in this respect require special attention. The other parts of this guide, and especially Part II, contain many other indications that can be useful in this phase of the project. Any project-based approach will involve great concern about the resources students will be able to access. The use of computer networks lends this issue a new dimension that calls for very special attention. In any project, the resources we can call upon are automatically numerous. However, they are not all equally relevant. And even among the relevant resources, choices have to be made that are often difficult. What the students and their teacher already know about the project topic or question and the skills of some students in making use of such sources as libraries, local organizations, businesses, public institutions and the Internet are the first factors to be taken into account. Next come the equipment and documents (written, visual, computerized, etc.) that are readily accessible in the classroom or the school. The plan discussed above will indicate, still in collaboration with the students, what resources will take precedence and what will be done to ensure that they will really be available or accessible. If required, an initiation period will be planned. It may also be necessary to plan to buy a software program, CD-ROM or some other document or obtain permission to go someplace or interview somebody. Project scheduling over time, the division of labour among the teacher, students and groups of students and the other aspects of work organization will be planned to reflect the project's learning objectives, but also the students' existing knowledge and interests. Planning a learning project means defining its topic, identifying its objectives and the criteria to be used to gauge their proficiency level and plan the resources needed to achieve it, and then shaping all these elements into a concrete work plan. This organization will have to enable every student and group of students to make a significant contribution and consolidate existing understandings and skills as well as assimilate new ones (see Talbot, 1990, p. 113). In some cases, "learning contracts" will shed useful light on these various points for all concerned. Several proven strategies exist for fostering interaction among students while enabling each of them to make a contribution and develop various abilities. One of them is what we generally call "cooperative learning". Another is the method that asks students to delve thoroughly into one aspect of a topic or question and then present the results to their group for discussion. We may also consider a system where, in rotation, a representative of each group visits another group to present his own group's project results. To be avoided is any fragmentation of the work that stops a student from making the connection between what he is doing and something bigger. Organizing the work also presupposes that the class adopts some operating rules that include ethics (recognizing everyone's work, mentioning sources, paying attention to everyone's opinions, etc.). The more the students see these rules as necessary for achieving the project objectives, the less time the teacher will have to spend enforcing them. Spontaneous compliance with rules agreed on by students will be one of the best signs of the interest the project is arousing in the students and the effort they are putting in to see it through. It is during this phase that the project takes shape and comes alive. The class's raw material then becomes information, in the broadest sense of that term. Sometimes individually and sometimes in small groups, but always with a sense of collaborating in a common goal with their teacher's support, the students are seeking, processing and creating information. To this end they amass data, conduct experiments, meet with resource persons, analyze, compare, weigh, measure, calculate, write, draw, discuss and carry out a number of similar operations that reflect their ages and the topic in question. While all this brainstorming is going on, the teacher keeps one eye on their adherence to the existing plan and with the other makes sure that student interaction and collaboration are helping to build a community where the central concern is learning. Accordingly, the teacher will promote frequent and open communication among the students, pass around information about available documentation to who is in charge of various tasks, invite the teams to regularly survey their work progress, periodically go over the project with the whole class and use this occasion to encourage, stimulate and, as needed, refocus. This is unquestionably the phase where the computer is most used. The use and possibly the production of online resources will add a value that would be very hard to get by other means. Part V below lists a number of resources that can enrich, accelerate and facilitate the work required during the activities described in the following paragraphs. To see this phase and the two key activities planned for the process as a whole in their proper places, it will probably be useful here to refer to Figure 1 above. Sticking to the plan agreed on in the initial phase, the students learn by researching, processing and creating information and apply themselves to giving the results of their learning tangible form in a product or service. Thinking and documentation (in the broad sense of the term) develop hand in hand. Tapping the potential of the networked computer in the classroom offers a host of advantages -- for example, providing current data on a large number of topics and real problems and facilitating cooperation among students within a class or with other classes -- but poses a number of challenges as well. The young students' search of the Internet for relevant and specific information may be accompanied by frustrating glitches, even in cases where the preparation of these students in computer skills is felt to be satisfactory. The quantity of problems connected with computer use that students have to deal with, even in senior high school, will be a concern for the teacher. What may be required will depend largely, beyond the students' skills level, on the type of work going on and the software or groupware that is available. The engagement or, conversely, avoidance strategies students use is another matter that will call for continuous watchfulness by the teacher. Even though there are numerous experiments to show that computer use for learning purposes heightens students' motivation (see Réginald Grégoire inc., Bracewell and Laferrière, 1996, p. 9), it still remains that some students faced with the inevitable problems that arise in projects will be tempted to settle for token participation only. In such cases, teacher intervention may prove necessary (see Meyer, Turner and Spencer, 1997). Here as with the problem of computer skills, the same principle applies: students have to feel able to achieve the identified objectives or else measures have to be taken to give them this feeling. The coordination and supervision systems used and the kind of support provided will vary with student skills and types of activities. They will foster independence in students and student groups and place the emphasis on learning in itself rather than perfecting products, though never minimizing the need to always aim for quality products. The various contributions will be prepared and presented in line with the plan agreed on in the planning phase or altered in the meantime. Each presentation will be followed by questions and comments as well as a discussion on what it adds to the class's collective production. The teacher will especially highlight the positive aspects while also mentioning things that could have been developed further or done another way. In a relaxed atmosphere, this activity can also lead to questioning about group work, responsibility, research techniques, the distinction between true and false, the teacher's role, etc., as well as interesting ideas for future projects. Bringing together a final collective product may require some time. By the nature of things, the teacher will be called on to intervene more directly with the whole class during this activity than during the development of products within small groups. On some aspects, however, the students may be called on to work in groups again. This will probably be the case, for example, if the collective product is a journal, audiotape or a series of graphics or else involves travel outside the school (e.g. to a seniors' residence). What exactly did the completed project enable us to learn? What could have been done differently or could be done differently in the future? What could or should be done to follow up on this project? 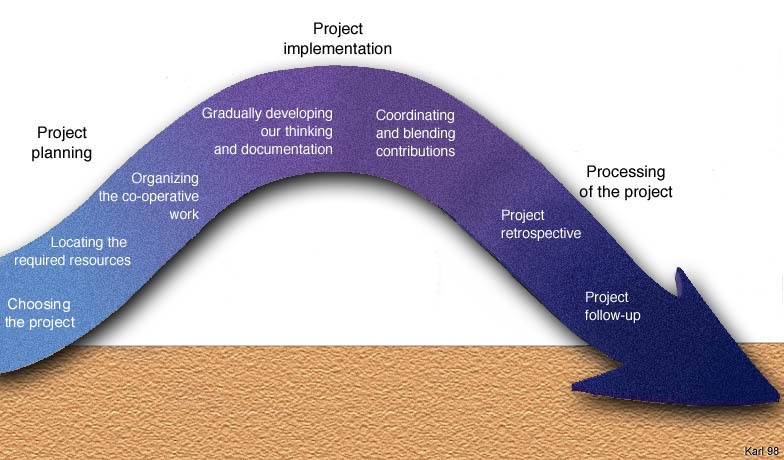 In the following paragraphs, the "Project retrospective" activity comes back to the first two questions and the "Project follow-up" activity deals with the third. The collective product reflects the learning efforts completed. We now have to go back over everything to make an assessment and integrate the conclusions in a larger whole. This retrospective, which the teacher will fine-tune to the students' ages and the features of their project, could focus on its metacognitive, cognitive and social aspects. There are several ways of doing this: whole-class or small-group discussion, tests followed by comments on the results, games, applications in a slightly different context, etc. Going back over its metacognitive aspect will enable the class members to ask themselves about their individual and collective involvement in the project. Did they mechanically perform the tasks in the plan or were they looking for answers to questions? In more difficult situations, did they use more than one strategy? Overall, did they work with method? Did they regularly check on their progress? Did they show perseverance? Did they make efforts to memorize some of the information? On balance, what mental processes did they use and which did they leave out? The cognitive retrospective will lead to questions about what was learned and how well it was assimilated. This could be organized around such questions as: To what extent were the learning objectives achieved? During the project, what links were made with earlier learning acquisitions? What questions remained unanswered or were answered unsatisfactorily? Was this project an occasion for learning in the area of language? History? Mathematics? Another subject area? In these same subject areas, were gaps noted that interfered with the project's development? Finally, the social retrospective, which is very important in the project-based approach, will open the way for discussion of certain values (attention to others, responsibility, critical awareness, democratic attitude, etc.) and suggest such questions as: What did we get out of working with others on the same topic? What turned out to be the biggest problem? How could we make working in groups more motivating? Follow-ups or extensions can use the classroom framework but also have a wider scope. They can be explicitly educational or focus on matters where the educational outcomes are less obvious. Would the project results not be useful to other classes in the school or another school? Could some of these results not be made available on the Internet? Would it not be appropriate to invite the parents and possibly other people (the school principal, people consulted on the project, etc.) to an exhibit of the project results or a special presentation of these results prepared especially for them? These are a few questions that come up infrequently in regular schools but arise spontaneously in a project-based approach. It may also be felt appropriate, following the project retrospective, to assign a small group to round out the information on a particular aspect of the project or do a classroom review of some basic learning that was not as fully understood as one had thought. The project-based approach also leads to the discovery that the content and logic of the curriculum do not always match up with classroom imperatives! The completed project will unquestionably have aroused a desire to embark on other projects. The teacher will carefully collect any suggestions for consideration at the proper time. If the project has been one with a certain scope, people outside the class will probably have been consulted or performed some service for a small group or the whole class. Would it not be appropriate as a mini-project to thank these people and tell them about the final outcome? It might also be a good idea to make the principal's office or other authorities aware of any suggestions about what could be done to facilitate the planning and implementation of learning projects in the future. A project will be all the more successful if the students' participation and their contribution to the topic or the understanding of a question or problem have had impacts on the class as a whole. This will occur if, for example, the "artifacts" or products of a small group of students have attracted the interest of other students and enabled them to expand or refine their own learning processes. A class demonstrates that it is becoming a learning community when students manage to converse on various topics, questions, issues and problems using the appropriate concepts, express fresh ideas and discuss the meaning of ideas and principles. The class's collective knowledge is revealed through the analogies used, the conceptual networks established in pooling sessions, the scenarios proposed and the narratives or stories (5) developed by the class around a given topic. Coming back to the basic concepts described in Part III, these demonstrations of what the students have learned are in fact signs of meanings or interpretations the students have come to share concerning a given learning objective - in fact, shared meanings. Less tangible but no less persuasive as evidence of the existence of a class learning community are the mental capacity and collaborative habits that students will develop. On this subject, the comment by philosopher Pierre Lévy (1997, p. 201) is inspiring: "The ideal mobilizer for the computer world is no longer artificial intelligence (making a machine as intelligent if not more intelligent than a man), but collective intelligence, namely the optimal use and synergism of skills, imaginations and intellectual energies, whatever their qualitative diversity and wherever they may be." (3) These criteria are the ones the teacher will use for individual student evaluations as the project is going on and at the end of the second process phase. (4) Remember that this product can assume many forms including, as with some of the I*EARN network's projects, an actual service (see above, III, 2). (5) The work of Roger Schank (1990), a key figure in artificial intelligence, highlights the importance of narration as a mode of understanding. As it is not easy to recall abstract ideas by making stories, one can better remember and bring past experience to life. For Schank, it is the main way through which we acquire and access knowledge. The practice of project-based collaborative learning and computer networks are here seen as inseparable. This integrated system holds immense potential but is unquestionably also demanding on both students and teachers. The latter will call on their experience to foster more meaningful learning and a more participatory class organization. Their cooperative work, time management and conflict resolution strategies will serve them well, but they will undoubtedly also need to expand and deepen their own training as part of an individual or collective learning project that they will have taken on personally. As well, inadequate understanding or experience of non-traditional teaching approaches will be a problem. Whether or not the teacher is already familiar with the project-based approach, he or she will have other obstacles to overcome: lack of technical skills, a shortage of teaching resources and best practices to rely upon, limited access to network computers, all manner of delays regarding equipment, the purchase of software, availability of training, etc., unfortunate staff changes and the very nature of curriculum and student characteristics (see In-Sook, 1996 and Collis, 1996). Nonetheless, as demonstrated by the experiments cited or mentioned here and there in this guide, there are many teachers already at work. Part II above pinpoints five observations concerning the types of projects completed or in progress in recent years. These observations provide directions that it would be good to keep in mind when choosing resources and deciding how to use them in a specific project. It will be necessary to have access to information, models, support and tools for projects of the type proposed in this guide. In these areas, the network computer offers unheard-of potential. The following pages provide a brief overview of resources that are felt to be useful grouped into five categories. These categories place the emphasis respectively on resources that offer abundant and varied information, encourage dialogue and the exchange of ideas, introduce projects as such in all their diversity, bring logistic support to collaboration and increasingly to "telecollaboration" that requires a project-based approach and, finally, enable teachers to exchange information, ideas and resources and continue their professional development. Each of these categories corresponds to a particular concern. However, since in one way or another all the resources listed are involved in learning projects and since hyperlinks and other crossovers are virtually limitless on the Internet, it can be useful to cross-reference from category to category. All these sites have been created and are maintained by public or quasi-public organizations, foundation, associations, research teams or, on occasion, individuals who donate a lot of their time. Accordingly, access to most of them is free of charge; in some cases, however, registration is mandatory. These sites are illustrative of the resources that may be accessed through the Web. Others might be found as or more relevant by individual persons or groups. These lists are comparable to information source lists but they also contain, to varying extents, substantial information on a number of subjects. In all probability their number and value will increase in the coming years. Canada's School Network (SchoolNet) (http://www.schoolnet.ca) is a virtually inexhaustible source of information in French and English concerning math, science, the social sciences and the arts. Interactive activities and activities based on interpersonal communication are available here. Elementary and secondary school students will find, for example, digitized collections of texts, images, audiotapes and videotapes useful for their research (http://www.schoolnet.ca/collections/). The Young Writers of Canada (http://www.rescol.ca/vp-pv/jec/e/) group also publishes original works on the site; these writings are considered as contributions to the literary resource of the community and to Francophone culture in North America and the world (http://www.schoolnet.ca/info/manuals/virtualprod/jec/new/jec.htm). Links are planned to the sites of the education departments of each of the provinces, which also contain large numbers of relevant documents. In short, anyone checking the SchoolNet site is assured of gaining access to the vast majority of Canada's education-related electronic resource sites. The National Library of Canada (http://www.nlc-bnc.ca/ehome.htm) is making more and more electronic resources available to the public in both French and English. In particular, it offers information on Canada related to most subjects taught. The Gutenberg Project (http://promo.net/pg/) also contains a number of literary works. As well, there is a site on the complete works of Shakespeare (http://the-tech.mit.edu/Shakespeare/works.html) and on subjects such as the U.S. Civil War. On the Unicef site (http://www.unicef.org/voy/), students can exchange ideas on such topics as children's rights, children and war, child labour, girls and discrimination, etc. KIDLINK (http://www.kidlink.org/english/general/overview.html) promotes contacts among world youth. The KIDLINK Writing Studio (http://www.kidlink.org/KIDPROJ/Kidwriters/) invites young "writers" aged 15 and under to get involved in discussions. Adults are not allowed to write in the discussion groups. As well, KIDLINK will soon be opening a French café. Global SchoolNet Foundation (http://www.gsn.org) also connects up youth from all over the planet and helps teachers wanting to get their students to communicate with other classes.Various sites offer such activities as letter-writing to learn a second language (try http://www.tact.fse.ulaval.ca/courvill). Teacher Elizabeth Murphy's FSL (French as a second language) site (http://calvin.stemnet.nf.ca/~elmurphy/emurphy/home.html) includes a discussion list on this topic. The Giraffe Program (http://www.giraffe.org/) widely implemented in U.S. schools, emphasizes the importance of "stretching your neck out for others." Experts (teachers, professors, researchers) are offering "telementoring" services, an example being the Electronic Emissary that helps teachers find such experts (http://www. tapr.org/emissary ). No group of this type exists in Canada, although various associations such as ACFAS (the French Canadian Association for the Advancement of Science) will facilitate access to Francophone experts as needed. Some sites will specialize in a curriculum subject area or group of subjects. These are information sites but they will also often be coordinating projects using network computers. Among these sites is the Writers in Electronic Residence (WIER) (http://www.wier.yorku.ca/WIERHome.html) which invites young people to submit their work to actual writers who provide on-line feedback. Potential collaboration arrangements using these sites would involve, on the one hand, students from different classes and on the other hand, teachers, researchers and professional organizations along with experts who combine to produce mega-inventories of resources around megaprojects such as the U.S. National Geographic Society (http://www.nationalgeographic.com/resources/ngo/education/). This is the same organization which in 1986 suggested that the National Science Foundation join in creating the National Geographic Kids Network Project in which over 4,000 classes from all over the world have been part of exploration and research projects of all kinds. MegaMath (http://www.c3.lanl.gov/mega-math/welcome.html), a site launched by the Los Alamos Laboratory, offers "hands on keys" activities for elementary pupils. In science, some sites are coordinating scientific expedition-type projects. The Bank Street College of Education's Voyage of the MIMI is a relatively complete array of multimedia resources-videos, CD-ROMs and Web pages plus paper documentation in connection with subject integration projects on the expeditions of the MIMI: (http://www.nysunburst.com/lp_obs_examples/html/mimi2.html). This project is based on the story of a little 10-year-old boy on a visit to his grandfather, whose boat, the MIMI, has juts been hired by a team of scientists and their assistants for whale research off the coast of Maine. The lives, explorations and discoveries of the boat's residents are described. The use of this educational resource has given rise to many interdisciplinary projects based on local curricula, an example being Diane Yee's Saskatchewan experiment: http://www.acs.ucalgary.ca/~dlyee/mimiho.html. See too, on results sharing: http://www.district44.dupage.k12.il.us/mimi.html and the site of the following U.S. school district: http://www.district44.dupage.k12.il.us/schoolsites.html. The JASON Project (http://www.jasonproject.org) was launched by Dr. Robert D. Ballard in 1985 in response to the many letters he had received from children concerning his discovery of RMS Titanic. Classes participate in annual expeditions. The Mission to Marsproject (http://www.moonlink.com) enabled students to stay in contact with scientists during that mission. NASA's Moonlink educational program offers students a chance to be part, using the Internet, of a space mission code-named Lunar Prospector (same address). Students from all over the world work together in experiments around certain discoveries made by the scientific team. The Journey Northproject (http://www.learner.org/jnorth/jnorth.html) in maths and science is financed by the Annenberg Foundation and the U.S. Public Broadcasting Corporation (PBS). This project enrols students in a planetary study of animal migrations in connection with research scientists. Linked by the Internet, students from Canada, the U.S. and Mexico have made a map of the Monarch butterfly's migration route. According to the editor in chief of the periodical Educational Leadership, this project is a fine example of the type of education valued by today's educators (Brandt, 1994, p. 3). Founded in 1965, the Technical Education Research Center (TERC) (http://www.terc.edu/projects/projects.html) is dedicated to the advancement of the teaching and learning of maths and science. It has won international recognition for its creation of innovative curricula, its active support for ongoing training for teachers, its pioneer activities in inventive uses of technology in education and its contribution to educators' understandings of the learning and teaching processes and the development of fairer training resources for neglected learners. It is conducting or coordinating a number of projects where the network computer plays a conspicuous role, some of which have a planetary dimension http://www.terc.edu/TEMPLATE/projects/item.cfm?ProjectID=8. Co-NECT(http://www.co-nect.com) offers resources but also supports students and their teachers in solving real problems. With financial support from the National Science Foundation, its Project-oriented classroom communities have placed the emphasis on networks and distance communication with peers. Among the projects that have been conducted within this framework may be mentioned Community of Explorers, Urban Math Collaboratives and Shadows. In the first of these projects, high-school science teachers collaborated on developing computer simulations to study such phenomena as gravity, relativity and photosynthesis. The students exchange their project results. The Urban Math Collaboratives project is a national network of maths teachers participating in an experiment aimed at making better use of the cumulative advantages of Internet connections as compared to the simple recording of information accessible on call. Finally, Shadows is a project whose objective is to facilitate significant discussions in and between elementary classes. Participating classes will, for example, collect and share data on the sun's shadow and other phenomena in order to verify their theories about the relationship between the Earth and the sun. The I*Earn network (see above, III, 2: http://www.iearn.org) enables students to contribute to real changes in the world by using the Internet (http://www.igc.apc.org/iearn/projects.html). The learning circles organized by Margaret Riel (http://www.iearn.org/iearn/circles/lc-home.html) are highly successful. The Global SchoolNet Foundation(http://www.gsn.org) also facilitates participation in projects on the planetary scale. This applies especially to the Noon Shadow Observation Project that is to run from February 1 to May 15, 1999. The KIDLINK site (http://www.kidlink.org/KIDPROJ/) boasts a profusion of projects in which English-language students communicate among themselves. Learning objectives dealing with English as a second language can be piggybacked here. As a first-generation collaborative tool operating on an intranet, First Class has made the Village Prologue available to hundreds of young Francophones. The creation of the Web has given rise to the development of software for publishing Web pages and student work. One of these programs is HyperStudio (http://www.hyperstudio.com/), which is also available in French. HyperPage is a Quebec-developed program that performs similar functions. Many other programs are useful for collaborative projects. For example, Inspiration (http://www.hyperstudio.com/) and Stella (http://www.stella.com/) enable user to create charts representing conceptual networks and publish them on the Web (see Hyerle, 1996). However, the second-generation tools-Web sites that constitute veritable environments for collaborative learning with Web-based software-are the ones best in tune with the general orientation of this guide. Students work directly in virtual spaces and digest the work carried out by students from elsewhere as well as their own classrooms. The teacher guides them in these environments, which are actually Web pages specially designed to support collaborative learning. New pages with illustrations and in some case sound and video images can easily be created and placed in the site server directly by users (teachers or students). As no purchase of intermediate software is required (for example, to publish Web pages) and management of the local technology is cut to the minimum (this is a distance operation), there is normally a charge for using these sites. WebCSILE OR WebKNOWLEDGE FORUM (http://csile.oise.utoronto.ca/demo.html). The site content is based on important results from research conducted at the University of Toronto's Institute for Studies in Education (see CSILE/Knowledge Forum). This Web environment supports projects based on collaboration among students to develop understandings. The Project-Based Learning Support System (PBLSS) Web site, (http://tiger.coe.missouri.edu/~most) developed by the University of Missouri in Columbia integrates an array of tools. Its objective is to help students with a research process that runs parallel to that of professional researchers. The pedagogical support, scaffolding or coaching processes are featured along with the following four learning processes: the planning and pinpointing of resources, the mental representation of knowledge, communication and collaboration and reflection (see Laffey et al., 1998, pp. 73 and 75). The University of Michigan team of professors Krajcik, Soloway, Blumenfeld and Marx makes a tool available to teachers for designing science learning which facilitates the graphic representation of projects and the connections among its parts (topic or question, notions and concepts, activities and products). This tool can be downloaded from the following address: http://www.umich.edu/~pbsgroup. The Virtual-U is a Web environment developed for older students by Simon Fraser University. It supports collaborative learning at a higher level (discussion forums, personal working space, document deposit, etc.). Learning Spaceis a Lotus Notes spin-off and the first collaborative tool to achieve popularity in the working world. The Education Networkof Ontario (ENO) (http://www.enoreo.on.ca) has now been in existence for several years. Organized by the Ontario Teachers Federation, this network is one of the biggest around. TACT (Technology for Advanced Collaborative Teaching), a virtual community for exchanges and mutual assistance (http://www.tact.fse.ulaval.ca), is made up of seasoned and beginner teachers trying to use the network computer for the benefit of learners. An integral part of the TeleLearning Network of Centres of Excellence (TL*NCE), this community is also interconnected with other communities. Laval University places the emphasis on activities tied in with the project-based approach that are carried out by student teachers in conjunction with cooperative teachers. At McGill University, a five-day summer session extends the educational component of the work carried out by teachers participating via their school Web sites during the school year. In North America, the U.S. west coast is where the practical knowledge and ongoing education process within trade or professional communities first made themselves felt. Today, Tapped In(http://www. tappedin.sri.com) is using these research results to offer teachers a chance to belong to a virtual community of education professionals committed to reforming the education system. Judi Harris,a professor at the University of Texas in Austin and an early worker on the Web (http://ccwf.cc. utexas.edu/~jbharris/Virtual-Architecture), highlights the interest of teacher experiences, facilitates exchanges of views based on their practices and suggests various model learning activities using the Web (see Harris, 1998). Project-Based Learning (PBL)(http://www. autodesk.com/foundation/pbl) is a network offering teachers a place for information and discussion about the project-based approach (frame of reference, implementation strategies, illustrations, evaluation of results, etc.). Best Practices in Education (http://www.bestpraceduc.org) showcases exemplary practices mainly coming from teachers, while New Horizons for Learning (http://www.newhorizons.org) is intended as an international community of mutual assistance and learning for people who are interested in promoting an expanded concept of learning. Columbia University's Learning Technologies Institute keeps track of various types of educational projects, some of them coming from schools (http://www.ilt.columbia.edu/gen/ index/index.html). New Jersey's Union CitySchool District (http://www. union-city.k12.nj.us/) offers an interesting example of an effort to develop a community of practice among its 800 teachers. In the context of this guide, the site is all the more significant in that its technological network is highly developed: Internet access is generalized in classrooms and "the tremendous educational resources available on the Web have a role in the classroom equal to traditional print material" (Honey, Carrigg and Hawkins, 1998, p. 129). The overall reform project under way since about 1990 specifically provides for fostering "collaboration skills" in students (Ibid., p. 124); the 1995-1998 three-year plan places the emphasis on "collaborative learning through project work" (Ibid., p. 130); teachers are seen as "facilitators encouraging students to collaboratively discover alternative methods of problem solving and creative expression (Ibid., pp. 129-130); teacher training occupies a lot of room and takes many forms that include teamwork on curriculum-related projects and, in the context of a site already mentioned (Tapped In), collaboration on mathematics with teachers from other school districts. Virtual communities cannot replace the support of local authorities and close colleagues in ensuring the renewal of educational practices, but they can welcome teachers who are interested by the project-based approach and, though perhaps less frequently, teacher teams seeking their own renewal. It is therefore suggested that you join the GrassRoots community of practice (http://www.schoolnet.ca/grassroots). On the French side, this will be organized by the community telelearning TACT (Télé-Apprentissage Communautaire et Transformatif) team that worked in close collaboration in preparing this guide. Each of the guide's five parts will be used as a basis for discussion in the forums to be opened to get this community going. The GrassRoots projects, in most cases planned and prepared by teachers, represent first-hand material as food for thought and new project development. We will be discussing, for example, the introduction of new classroom routines, the student role in a project-based process using network computers, learning project management and ways to facilitate learning by all students. What a wonderful opportunity we, the members of the teacher and student communities, have been given to live when invited to work on a project-to-project basis, while making use of networked technologies. As a matter of fact, in the project mode, both students and teachers have found again their freedom of thoughts and their right to live through new education experiences. Together, they do not feel to be limited to the strict acquisition of knowledge function but for them, to know means also to know how to think, how to become and how to live in a community. Being one of the teachers who make it a practice to associate my students to the choice of project themes as well as the formation of teams and the evaluation of results, I feel now a new breath of fresh air and the need to tell my happy feelings at the sight of the creativity and motivation shown of our youth. I feel proud to be part of this beautiful change occurring in our social order, namely giving back to the young the right to express their views even when they differ from the hierarchies of values put in place by adults and organizations. The networks open new channels of communication. Using the electronic courrier, the young are in a position to contact directly their ministers and other authorities, their preferred authors and, should we add, their teachers. Consequently, those people are in a position to get to know the young with whom they are regularly in contact, Curiously enough, the structures which were painstakingly put in place are now short-circuited by the new électronic networks. Thanks to Internet, everything becomes available at the same time; all we have to do is to 'zap' and what we wish appears instantaneously. As a member of a team, we are allowed when we feel like it, to ask questions, to give an opinion, to inform the group about a specific difficulty we encounter or to share the pleasure of a successful endeavour. Actually, we put our ideas in abeyance; sooner or later, another person, a friend or a teacher for instance, will give us the opportunity to use them. The Earth has now become that " global village " already foreseen by Marshall McLuhan. In a snapshot, it is now possible to reach somebody from Magdeleine Island ou Germany and ready to answer a question or simply shoot the breeze. While participating in the implementation of a project or otherwise, the youngs are no longer passively listening to the teacher, they are very much alive. When we, teachers and students, elect to start a project in the classroom, we unconsciously adopt a rythm which is very much like the rythm of life. The elements of the program help us to get in contact with the reality and to get to understand the surrounding world; these elements are not disconnected from the on-going activities. Furthermore, each participant is recognized for his/her competence; cooperation is the golden rule to be used for the implementation of the works we wish to become reality. As members of the teaching community, we have the responsability to participate in the education of citizens capable to meet the exigencies of the third millennium. It is up to us to endorse this beautiful objective, to establish permanent links between students in our schools and to use the available resources outside the school area, to introduce the young to the open and fabulous world in which they live now and will live tomorrow. Abbott, J. (1998). Why good schools alone cannot satisfy the needs and challenges of the twentieth century. Paper presented at the Beyond the Year 2000 Conference of the Canadian Education Association, Quebec City, July 9-11. Alvarez, M.C. (1997). Communities of Thinkers: Investigating Interactive Scientific Literacy Environments. Paper presented at the Association for the Advancement of Computing in Education (ACE), 8th International Conference, Society for Information Technology and Teacher Education, Orlando, Florida, April. American Psychological Association (1993) Learner-centered psychological principles: Guidelines for school redesign and reform. Produced by the Presidential Task Force on Psychology in Education. Washington, D.C.
Anderson, J., Reder, L. and Simon, H. (1996). Situated Learning and Education. Educational Researcher, 25 (4), 5-11. Association québécoise des utilisateurs de l'ordinateur au primaire et au secondaire (AQUOPS) (1997). Quebec association of elementary and secondary school computer users). Un regard sur la pensée de Célestin Freinet (1896-1966) sous l'angle de l'utilisation de l'ordinateur en éducation. Extraits de textes. ("A glance at the thought of Célestin Freinet (1896-1966) from the standpoint of computer use in education" - http://aquops.educ.infinit.net/colloque/15colloque/freinet.html ). Bereiter, C. and Scardamalia, M. (1989). Intentional Learning As a Goal of Instruction. In L.B. Resnick, ed., Knowing, Learning, and Instruction: Essays in Honor of Robert Glaser, 361-392. Hillsdale, New Jersey: Lawrence Erlbaum Associates. Blumenfeld, P.C. et al. (1991). Motivating Project-Based Learning: Sustaining the Doing, Supporting the Learning. Educational Psychologist, 26 (3 and 4), 369-398. Brandt, R. (1994). Helping Professional Dreams Come True. Educational Leadership, 51 (7), 3. Bransford, J.D. et al. (1990). Anchored instruction. Why we need it and how technology can help. In D. Nix and R. Spiro, eds, Cognition, education and multimedia. Exploring ideas in high technology, 115-142. Hillsdale, New Jersey: Lawrence Erlbaum Associates. Bransford, J. D., Brown, A. L., and Cocking, R. R. (Eds.) (2000). How people learn: Brain, mind, experience, and school. Washington, DC: National Academy Press. Brown, A. L. (1997). Transforming Schools Into Communities of Thinking and Learning About Serious Matters. American Psychologist, 52 (4), 399-413. Brown, A.L. and Campione, J.C. (1994). Guided Discovery in a Community of Learners. In K. McGilly, ed., Classroom Lessons: Integrating Cognitive Theory and Classroom Practice, 229-270. Cambridge, Massachusetts: MIT Press. Brown, A.L. and Campione, J.C. (1996). Psychological Theory and the Design of Innovative Learning Environments: On Procedures, Principles, and Systems. In L. Schauble and R. Glaser, eds, Innovations in Learning: New Environments for Education, 289-325. Mahwah, New Jersey: Lawrence Erlbaum Associates. Brown, J.S., Collins, A., and Duguid, P. (1989). Situated Cognition and the Culture of Learning. Educational Researcher, 18 (1), 32-42. Chapman, C. and Freeman, L. (1996). Multiple intelligences centers and projects. Arlington Heights, Illinois: Skylight. Chavardes, M. (1966). Les grands maîtres de l'Éducation ("The Great Masters of Education"). Paris: éditions du Sud and Albin Michel. Cognition and Technology Group at Vanderbilt (1994). From Visual Word Problems to Learning Communities: Changing Conceptions of Cognitive Research. In K. McGilly, ed., Classroom Lessons: Integrating Cognitive Theory and Classroom Practice, 157-200. Cambridge, Massachusetts: MIT Press. Collis, B. (1996). Teachers and Telematics: Lessons from experience with computer implementation. Paper presented to the Second Congress on Education and Informatics: Educational Policies and New Technologies, Moscow, July 1-5. Copen, P. (1995). Connecting Classrooms Through Telecommunications. Educational Leadership, 53(2), 44-47. Davydov (1993), tr. S. Kerr.(1995). The Influence of L.S. Vygotsky on Education Theory Research and Practice. Educational Researcher, 24 (3), 12-21. Dede, C., ed. (1998). Learning with Technology. ASCD Yearbook 1998. Alexandria, Virginia: Association for Supervision and Curriculum Development. Delacute, G. (1996). Savoir apprendre. Les nouvelles méthodes ("Knowing how to learn: the new methods"). Paris: Odile Jacob. Desbiens, M. (1998). La pédagogie du projet ("Project-based teaching"). Unpublished. Ste-Foy: Laval University, Faculty of Education. Dewey, J. (1966). Democracy and Education. An Introduction to the Philosophy of Education. New York: Free Press (http://www.ilt.columbia.edu/academic/digitexts/dewey/bio_dewey.html). Feuerstein, R. and Rand, Y. (1974). Mediated learning experiences: An outline of the proximal etiology for differential development of cognitive functions. International Understanding, 9/10, 7-37. Foa, L. J., Johnson, M. J., and Schwab, R. L.(1997). Connecting Schools Is Only a Start. Education Week, XVII (2), September 10, pp. 52, 42 and 43. Goodrich, H. (1995). Teaching through projects: Creating effective learning environments. Menlo Park, California: Innovative Learning Publications. Gotovitch, L. (1996). Makarenko, pédagogue praticien. Paris: PUF (Pédagogues et pédagogies). Groupe Français d'äducation Nouvelle 1982) (French New Education Group). Agir ensemble à l'école. Aujourd'hui ... la pédagogie du projet ("Acting Together in School. Today Project-based Teaching"). In collaboration by the Soissons Group directed by Philippe Wuchner, Françoise Payen and Michel Huber. Preface by Robert Gloton. S. L.: Casterman. Harris, J. (1998). Design Tools for the Internet-Supported Classroom. Alexandria, Virginia: Association for Supervision and Curriculum Development. Hatch, T. and Gardner, H. (1993). Finding cognition in the classroom: An expanded view of human intelligence. In G. Salomon, ed., Distributed Cognitions. Psychological and Educational Considerations. New York: Cambridge University Press. Hewitt, J. and Scardamalia, M. (1998). Design principles for distributed knowledge building processes. Educational Psychology Review, 10 (1), 75-96. Hickey, D.T. (1997). Motivation and Contemporary Socio-constructivist Instructional Perspectives. Educational Psychologist, 32 (3), 175-193. Honey, M., Carrigg, F., and Hawkins, Jan (1998). Union City Online. An Architecture for Networking and Reform. See Dede, C. above, pp. 121-139. In-Sook, L. (1996). Challenges to a learning approach through a global network. Paper presented at the Annual Conference of the American Educational Research Association, New York, April, 8-12.
International Commission on Education for the Twenty-first Century (1996). Learning: The Treasure Within. Paris: UNESCO; London: HMSO Books (Delors Commission). Jonassen, D.H. (1996). Supporting communities of learners with technology: A vision for integrating technology with learning in schools. Educational Technology, 35 (4), 60-63. Karpov, Y.V. and Haywood, H.C. (1998). Two ways to elaborate Vygotsky's concept of mediation: Implications for instruction. American Psychologist, 53 (1), 27-36. Kilpatrick, W. H. (1918). The Project Method. The Use of the Purposeful Act in the Educative Process. Teachers College Bulletin. XIX (4), September. Printed separately with the same title and publisher: the text used was that of the 8th printing (1924). Krajcik, J.S., Blumenfeld, P.C., Marx, R.W. and Soloway, E. (1994). A Collaborative Model for Helping Middle Science Teachers Learn Project-based Instruction. Elementary School Journal, 94 (5), 483-497. Krapp, A., , Hidi, S. and Renninger, K.A. (1992). Interest, learning, and development. In K.A. Renninger, S.Hidi and A. Krapp (Eds. ), The role of interest in learning and development (pp.3-28). Hillsdale, NJ : Lawrence Erlbaum Associates, Inc.
Laffey, J., Tupper, T., Musser, D., and Wedman, J. (1998). A Computer-Mediated Support System for Project-Based Learning. Educational Technology Research and Development, 46 (1), 73-86. Lave, J. (1988). Cognition In Practice. Mind, Mathematics and Culture in Everyday Life. Cambridge, U.K. and New York: Cambridge University Press. Lave, J. (1991) Situating Learning in Communities of Practice. In L.B. Resnick, J.M. Levine and S.D. Teasley, eds, Perspectives on Socially Shared Cognition, 63-82. Washington, D.C.: American Psychological Association. Lave, J., and Wenger, E. (1991). Situated Learning: Legitimate Peripheral Participation. Cambridge, U.K. and New York: Cambridge University Press. Levin, J.A., Rogers, A., Waugh, M. and Smith, K. (1989). Observations on electronic networks: Appropriate activities for learning. Telecommunications in the Classroom, 16 (8), 17-19, 21. Lévy, P. (1997). Cyberculture. (Report to the Council of Europe) Odile Jacob and Éditions du Conseil de l'Europe (http://www.odilejacob.fr/fr/index.html). Loh, B., Radinsky, J., Reiser, B.J., Gomez, L.M., Edelson, D.C. and Russell, E. (1997). The progress portfolio: Promoting reflective inquiry in complex investigation environments. In CSCL '97 Proceedings, Toronto: OISE/UT, 169-178. Lundeberg, M.A., Coballes Vega, C., Standiford, S., Larson, L. and Dibble, K. (1997). We think they're learning: Beliefs, practices, and reflections of two teachers using project-based learning. Journal of Computing in Childhood Education, 8 (1), 59-81. Mann, L. (1998). Getting global with technology. Curriculum Update, Summer, 4-5. Alexandria, Virginia: Association for Supervision and Curriculum Development. McMahen, C. and Dawson, A.J. (1995). The design and implementation of environmental computer-mediated-communication (CMC) projects. Journal of Research on Computing in Education, 27 (3), 318-335. Meyer, D.K., Turner, J.C. and Spencer, C.A. (1997). Challenge in a Mathematics Classroom: Students' Motivation and Strategies in Project-Based Learning. The Elementary School Journal, 97 (5), 501-521. Moursund, D., Bielefeldt, T., and Underwood, S. (1997). Foundations for the Road Ahead: Project-Based Learning and Information Technologies. Prepared for the National Foundation for the Improvement of Education (NFIE) by the International Society for Technology in Education (ISTE - http://www.nfie.org/ra/eval/). Pea, R.D. (1992). Augmenting the discourse of learning with computer-based learning environments. In E. de Corte et al., eds, Computer-based learning environments and problem-solving, 313-343. Berlin and New York: Springer-Verlag. Pepi, D. and Scheurman, G. (1996). The emperor's new computer: A critical look at our appetite for computer technology. Journal of Teacher Education, 47 (3), 229-236. Perkins, D.N. and Grotzer, T.A. (1997). Teaching intelligence. American Psychologist, 52 (10), 1125-1133. PMI Standards Committee, W.R. Duncan, dir. (1996). A Guide to the Project Management Body of Knowledge. First edition in 1987. Upper Darby, Pennsylvania: Project Management Institute (http://www.pmi.org/publictn/pmboktoc.htm). Réginald Grégoire inc., Bracewell, R., and Laferrière, T. (1996). The Contribution of New Technologies to Learning and Teaching in Elementary and Secondary Schools. Documentary Review. Published in French as L'apport des nouvelles technologies de l'information et de la communication (NTIC) à l'apprentissage des élèves du primaire et du secondaire. Revue documentaire (http://www.fse.ulaval.ca/fac/tact/fr/html/apportnt.html). Resnick, L. B. (1987). Learning in School and Out. Educational Researcher, 16 (9), 13-20. Riel, M. and Harasim, L. (1994). Research perspectives on network learning. Machine-Mediated Learning, 4 (2 and 3), 91-113. Robottom, I. and Hart, P. (1990). Computer conferences in environmental education: Can the help transcend the "division of labour" in EE? In W.J. Rohwedder, ed., Computer-aided environmental education, 175-190. Troy, Ohio: North American Association for Environmental Education. Schank, R. (1990). Tell me a story: A new look at real and artificial memory. New York: Scribner's. Scardamalia, M. and Bereiter, C. (1985). Fostering the development of self-regulation in children's knowledge processing. In S.F. Chipman, J.W. Segal and R. Glaser, eds, Thinking and learning skills: Research and open questions, vol. 2, 563-577. Hillsdale, New Jersey: Lawrence Erlbaum Associates. SchoolNet (1996) Vision of Learners in the 21st Century. Vision Statement. Submitted to the Training, Research and Evaluation Sub-committee and Executive Committee of the SchoolNet Advisory Board. Secrétariat de l'autoroute de l'information (1997) (Quebec Information Highway Secretariat). Pour une école branchée. Un outil d'aide à l'intégration des nouvelles technologies de l'information et des communications dans l'école ("For a Wired School. A Tool to assist with integrating the new information and communications technologies in schools"). Quebec City. Talbot, R. (1990). L'enseignement par projet ("Project-based teaching"). Revue des sciences de l'éducation, 16 (1), 111-128. Vassileff, J. (1992). Histoires de vie et pédagogie du projet ("Life Stories and Project-based Education"). Lyon : Chronique sociale. Vygotsky, L.S. (English translation, 1962). Thought and Language. Cambridge, Massachusetts: MIT Press. French translation, 1985: Pensée et Langage (followed by a commentary by Jean Piaget). 2nd edition. Paris: éditions sociales. Wals, A.E., Monroe, M.C. and Stapp, W.B. (1990). Computers in interactive environmental monitoring projects: Bridging troubled waters. In W.J. Rohwedder, ed., Computer-aided environmental education, 137-152. Troy, Ohio: North American Association for Environmental Education. Ward, D.R. and Tiessen, E.L. (1997a). Adding Educational Value to the Web: Active Learning with Alive Pages. Educational Technology, 37 (5), 22-31. Ward, D.R. and Tiessen, E.L. (1997b). Supporting collaborative project-based learning on the WWW. CSCL'97 Proceedings, 299-307. Waugh, M.L. and Levin, J.A. (1998). Telescience activities: Educational uses of electronic networks. The Journal of Computers in Mathematics and Science Teaching, 8 (2), 29-33. White, B. and Frederiksen, J. (1995). An overview of the ThinkerTools Inquiry Project. Berkeley: University of California at Berkeley School of Education. Williams, Susan M., Burgess, K.L., Bray, M.H., Bransford, J.D., Goldman, S.R., and the Cognition and Technology Group at Vanderbilt (CTGV) (1998). Technology and Learning in Schools for Thought Classrooms. See Dede, C. above, 97-119. 6. Why is asthma so widespread in our region? 7. What technological invention could help to solve Earth's current problems? 10. Business studies : Howdoes an enterprisefunction? By several presentation modes: writing, diagram, map, photograph, sound, video, etc. products Databases: statistics or synthesis on a topic, list of addresses, etc.Texts and/or multimedia presentations: on situations, problems, solutions, experiences, writers, etc.Services: to individuals, groups, the community in general, etc.